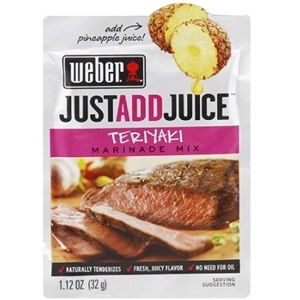 Sweet, citrusy pineapple juices adds zing to Weber Just Add Juice Teriyaki Marinade Mix's traditional Japanese blend of ginger, soy sauce and garlic. The natural acidity of the juice tenderizes the meat, and the flavor of the grill brings out all the fresh flavors and aromas. It's perfect for steak or chicken. Sugar, Sea Salt, Maltodextrin, Food Starch-Modified, Soy Sauce Solids (Soybeans, Wheat, Salt), Garlic, Caramel Color, Spices, Citric Acid, Salt, Xanthan Gum, Calcium Stearate (Anticaking Agent), Red Pepper, Vinegar, Natural Flavors, Lactic Acid, Paprika Extractives (Color), Hydrolyzed Soy & Corn Protein, Sulfites, Less Than 2% Silicon Dioxide to Prevent Caking. Contains: Soy And Wheat.